Negotiations between the U.K. and Qatar for the purchase of Typhoon fighters and Hawk jet trainers by the Gulf state are complete, and the two sides are now looking for a suitable date to sign the deal, according to a senior BAE Systems official. ...Assuming the deal is signed, it will be the first Typhoon sale by the British since the Ministry of Defence took over responsibility for leading the government’s Typhoon export sales effort from the Defence and Security Organisation, the department responsible for most overseas sales in the sector. The value of the Qatari deal is unknown, but it will run into the billions of pounds for the British aerospace industry as well as Airbus and Leonardo, their European partners in the Eurofighter program. Boardman hinted at a prolonged delivery schedule for the Qatari Typhoons, telling the parliamentary committee the deal will stretch assembly of the fast jet at BAE’s Warton site in northwest England to 2024. The current order book delivering jets to the Britusg Royal Air Force, Oman and Kuwait is set to end in 2022, he said. G777 and BMD like this. Poland will never buy Gripen or Typhoon. Not when there's an American choice available. Britain has signed a deal with Qatar to supply 24 Typhoon fighters as well as a weapons and training package — the biggest export sale of the jet by the U.K. in more than a decade. 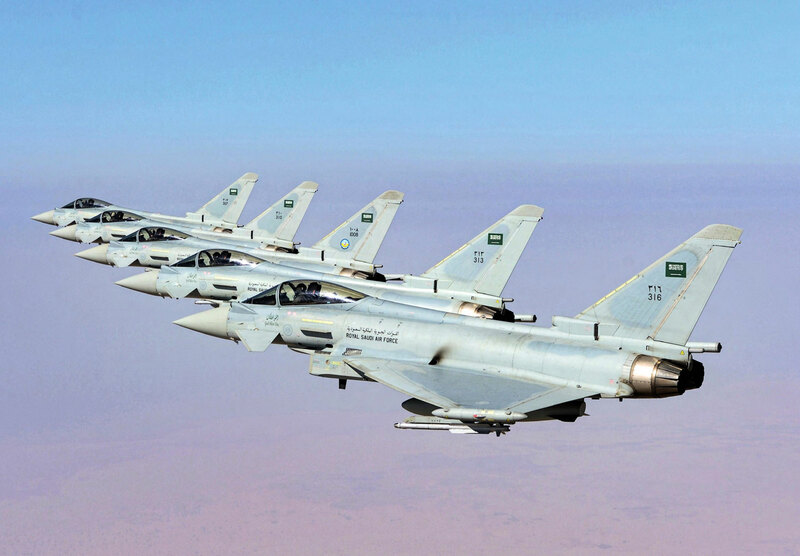 ...Aside from the Eurofighter Typhoon jets,the Qatar deal includes the supply of a weapons package covering MBDA-built Brimstone 2 ground-to-air and Meteor beyond-visual-range air-to-air missiles as well as Raytheon’s Paveway IV precision-guided bombs. The British Ministry of Defence said in a statement that during his visit, Williamsonalso agreed to a package of training and cooperation between the two countries’ air forces, which includes training for Qatari pilots and ground crew in the U.K.
Leonardo is preparing to begin the next testing phase for its next-generation Captor-E active electronically scanned array (AESA) radar, which will eventually equip the Eurofighter Typhoon aircraft destined for Kuwait. The first phase of test flights for the Leonardo AESA radar, which included unpowered and powered flights in the UK, wrapped up earlier this year with ‘excellent results’, according Alastair Morrison, SVP radar & advanced targeting at Leonardo Airborne and Space Systems. ‘There have been some really good long-range tracking results and we have been able to test the radar’s Synthetic Aperture Radar (SAR) mode as well,’ he explained. The next stage will see a second Captor-E flight test asset – also known as an instrumented production aircraft (IPA) – begin flights in Germany ‘very shortly’. According to Eurofighter, this will utilise IPA 8, a German-built test aircraft. ‘Currently we’ve been working with the first asset in the UK, having the second asset will allow us to run multiple programmes in parallel,’ said Morrison. The next 12 months will see Leonardo perform a series of ‘high intensity’ flight trials with incremental software updates to enable the required capability – known as the Phase 3 Enhancement (P3E) standard - to be available for the first deliveries to the Kuwait Air Force. The hardware has ‘an enormous amount of potential’ for future enhancements, said Morrison, owing to the amount of power it can generate because of its large antenna. Extra capabilities such as communications, passive use, electronic attack and advanced surface tracking techniques could also be on the cards in the future. The Kuwaiti Eurofighters – 28 in total comprising 22 single seat and six twin-seat – will undergo final assembly by Leonardo Aircraft in Turin, Italy. The German Defence Ministry said on Monday that the European fighter jet was in poll position to replace its Tornado jets, which it wants to phase out starting in 2025. The defence ministry replied to an official inquiry, about the statements of the Air Force Chief favouring F35s as the Tornado replacement. First to assume that role for Germany. RAF Typhoons dropped EPW IIs in Libya 6 years ago. Qatari order for 24 Typhoons signed in December. Before the order Typhoon production at the BAE Systems Warton plant had been expected to shut down in 2022 without further orders, but the two new deals secure thousands of jobs for several more years. BAE Systems CEO Charles Woodburn noted that the company is “committed to supporting the Kingdom as it modernizes the Saudi Armed Forces and develops key industrial capabilities critical to the delivery of Vision 2030,” the Kingdom’s economic diversification and social reform strategy. This has raised speculation about the part Saudi industry could play in production of the aircraft. Plans for the 2007 order for 72 Typhoons included later aircraft being assembled in Saudi Arabia, but they were all completed on the Warton final assembly line. However, some work on the 22 BAE Systems Hawk advanced trainers ordered by the Royal Saudi Air Force is undertaken in the Kingdom. If concluded, this agreement is expected to cover Typhoons equipped to the very latest standard, at least as capable as those currently being produced for Kuwait (a deal for 28 aircraft that was headed by Leonardo and the Italian government). Those aircraft are to be equipped with the Captor-E AESA radar and Pirate forward-looking infrared sensor. Weapon options for the Saudi Typhoons would likely include the Meteor, Storm Shadow, and Brimstone missiles from MBDA. Meanwhile, Typhoon’s chances of landing an order from Malaysia appear to have improved following a remark by the country’s defense minister concerning the European Union’s intention to reduce imports of palm oil, Malaysia’s prime export product and one that has been used as part-payment for various defense programs. In a post-Brexit Europe this policy—if implemented—could place a British-led Typhoon campaign at a distinct advantage over its French rival, the Dassault Rafale. Its been a while. A long time. We have many issues going on in the UK but we will prevail. Whatever the cost may be. What is a MOI and how engaging is it? With recent EF slides pointing to the possible integration of Al Tariq PGMs and the improved chances of the Saudi deal, UAE might follow, while the long term goal might remain the F35.